Many years ago a "Sunday House" was a small second dwelling maintained near a church as a weekend place of residence. It was also used for a farmer's weekend stay to gather supplies and spiritual revival. We hope that you will find our Sunday Houses as a charming getaway. The four smaller cottages are fully furnished, have one bedroom, bath, living area with LaZboy™ sleeper sofa, a kitchenette that is fully stocked with cooking utensils, dishes, full size refrigerator, microwave, stove and coffeemaker. All linens and towels are provided. Direct TV and WiFi are included in all units. Sorry, no pets and no smoking please. All units can accomodate up to four persons. The "Peach House" offers everything the other houses have, but has no seperate bedrooms. The front room is 24' X 24' with two Murphy beds, sleeper sofa and two twin roll-aways. The lavendar and turquoise cabins have two bedrooms--one w/ queen and one w/ twin plus sleeper. Coldspring Sunday Houses are located within a short drive from the Sam Houston National Forest, the Lake Livingston Recreation area, local shopping and activities. Please contact us for reservations and more information. 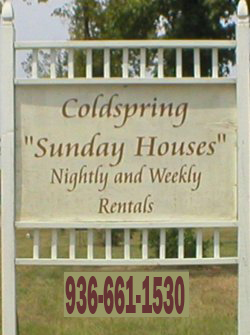 Copyright © 2016-2017 Coldspring Sunday Houses. All rights reserved.